TOP chefs cooked up a creative lesson for Ponteland students as they passed on their catering skills. Pupils at Richard Coates Middle School welcomed Aramark chefs Jonathan Duke and Paul Walton to the classroom as part of the national Let's Get Cooking Big Cookathon. 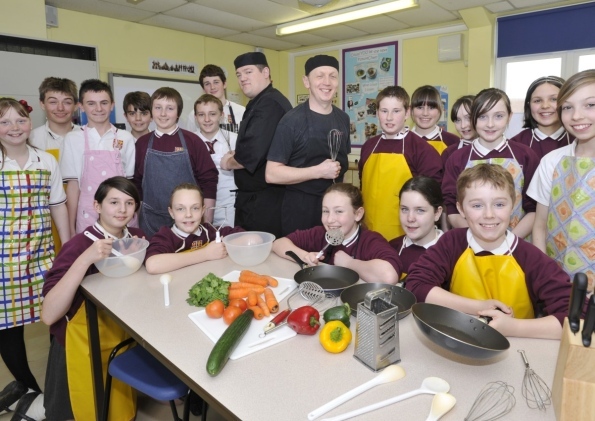 Around 230 community cookery events were organised nationwide through the initiative, with more than 3,000 pupils, parents and teachers from ten north east schools joining in. And the Ponteland youngsters were delighted with their share of the food fest. Food technology teacher Lisa Burton said: "The Let's Get Cooking clubs are really keen for people to work with industry professionals so we had two chefs that came along to work with our gifted and talented children and they provided everything. "They are top chefs and they showed the kids all the fancy techniques. "The children seemed to really enjoy it. The group who were taking part have really good skills already, but they certainly benefited from working with real chefs rather than teachers. "This was the first time we have worked with these chefs, but they are keen to come back into school on a more regular basis, which would be great." Let's Get Cooking is a network of after school clubs for children, their families and the wider community, led by the School Food Trust and supported by the Big Lottery Fund. It aims to give people the skills and confidence to cook healthy meals on a budget.